If you’re nervous about seeing a chiropractor because you don’t want to get snapped, cracked, or popped, then our office is for you. We only use the Activator Method® of correcting the spine and joints of the body. Previously we used the light force of the Activator IV in our office. 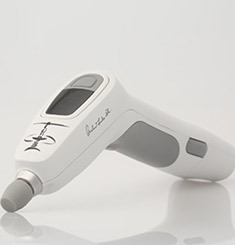 Now we introduce you to the latest advancement–The Activator V.
This FDA approved, chiropractic instrument, produces an electronic thrust of pressure even lighter than the Activator IV. It creates a force wave penetrating deeper into the body. It allows the doctor the ability to fine-tune the force and speed to make corrections without the body resisting the force, and without discomfort to the patient. Interested? Please give us a call.